When carrying out business process improvement, it’s essential to start by documenting and analyzing the As-Is business process. This helps you gain the insight you need on the inner workings of a process, allowing you to come up with potential improvement ideas. By definition, an “as-is business process” is the current state of the business process. Documenting it is essential for understanding how the process works and what the inefficiencies are so that you can later make improvements or even redesign the process entirely. Process Documentation – Your new employees won’t know how any of the processes work. Rather than having to explain it over and over again, you can just show them the documented process. Before you can actually analyze the as-is process, though, you should create a process map. The first step there is to actually understand the process. The most common mistake managers make here is assuming they’re the expert on any process. In reality, though, process improvement ideas rarely come from the C-suite. It’s from the people who really understand the ins and outs of the process: your employees. So let’s say there’s a problem with employee onboarding. To get a good idea on how to improve the process, you’d need to talk to everyone involved in the process: the HR, office manager, and the department supervisor. Then, once you’ve established who’s involved, you need to get the right information. This is usually done by either observing the process or interviewing the key employees. When you’ve gathered all the information, you can actually start with the process map. In other cases, if you’re trying to do a specific type of analysis, there’s the value stream map, SIPOC diagram, etc. Pen & Paper – The most straightforward approach. Grab a pen and a piece of paper and draw the process as a flowchart. Flowchart Software – Tools dedicated to creating process flowcharts. These are more useful if you’re planning on sharing the documented process with your employees digitally. 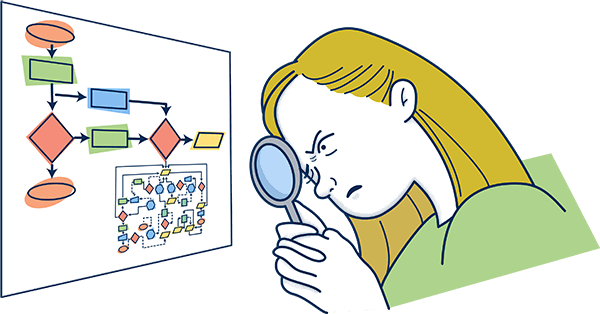 If standardization or documentation is your main goal, you’ve already done your job once you have the process map. If, on the other hand, you’re going for process improvement, then you need to analyze the as-is process. Want to start using workflow software, but not sure which provider to pick? Check out our guide on how to pick the best workflow management system for your business. Since every process is completely different, there’s no one-size fits all formula for analyzing it. You can try asking yourself the following questions, however, for gaining insights. Are there missed deadlines for the process? Why? Which steps have the highest impact on process output? Think, product quality, price, etc. Is there any way to automate them? Make them more efficient? Are some of the steps taking longer than it’s reasonable? Are they costing you more than what would be reasonable? Why? Other than that, you can also use several process analysis techniques such as the 5 Whys to gain more insight into potential improvements. The gist of it is, whatever issues you have with a process, you keep asking “why” until you find the root cause of the problem. Once you have a good idea on how to improve the process, you need to create a to-be process map. That’s the future step of the to-be process – how the process will be after you make changes and improvements to it. The to-be business process will help you put the changes you want to make down on a map and finally implement them. What is Define, Measure, Analyze, Improve, Control (DMAIC)?